This poor craft blog. Its suffered months of neglect: no words, no pictures. Some 722 blog posts have been sitting about, gathering dust. The only visitors have been ones with unusual names like Viagra, Toilet Paper, Learn Spanish and Protein Powder (.. granted they do always stop and take the time to leave such thoughtful shopping recommendations). Anyway, its time to pull up my socks and get writing again (although I am at a loss to explain how socks will help ... unless they are toe socks, because they like, totally help with typing). 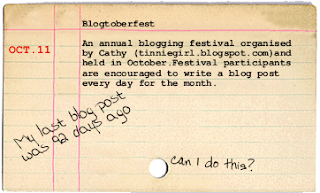 To get back into the habit, I'm joining in with the an annual blogging event, Blogtoberfest. So I'll see you again soon .... I'll be the one in the stripey socks. I was just about to go to bed when I saw a post from you pop up & was EXCITED! I LOVE your blogtoberfest posts; I still think about the duck on the loo photo (don't look at me like that...)! You've made my evening Liesl; Happy Blogtoberfest. PS; My verification word is "happigas" hehe. Now, how to make *ME* blog - that would be massive!! Will they be knitted by you socks? Good to see you back blogging again!!! Lovely to 'have' you back Leisl! I'll shout you a mojito if you make it all the way through! Glad you took the hint. I didn't want to have to force you. Yaaaaaaaaaaaaaaaaah! So glad you're back in the land of blog. I really missed you! Hey lady, nice to have you back. Hope all is well in your corner of Melbourne. My (once upon a time) 5 year old ran away from home over a costume "misunderstanding" I was sure she asked for frog! Glad you're back! I missed your witty posts!